Saw this video of the Great Western Series Pro-Am Tournament on Christopher Richter’s youtube channel. 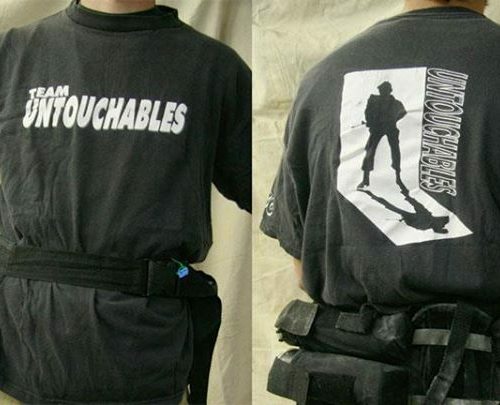 At 13:30 the All American’s are playing the Untouchables, a pro team out of Southern California that played Great Western and NPPL in 1993-1995 (I think)? Edit: Unfortunately, the video isn’t working any longer. Last year (or was it the year before?) I met Lennie Villiados who played on the Untouchables, Team Genesis, Fatal Swoop, and a few other teams. Lennie and his brother Les ran the California Paintball Park in Castaic, California (North San Fernando Valley). 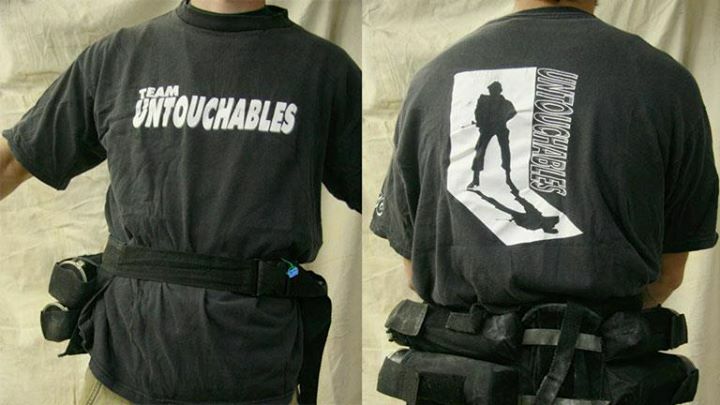 I have attached pictures of one of Lennie’s Untouchables T-shirts. Also in this video you can see one of the Gardner brothers wipping a hit. Lennie pointed it out to me at 1:35 but I think it’s replayed again when the music isn’t playing. It may have been during the game against the Untouchables. Opps, forgot to attach the picture of the shirt the first time I posted! The Great Western Series was run throughout the 1990s by Russell Maynard. This flag dates to 1997 and lists a variety of sponsors. Joe Gorcsos explains the merging of the Florida Annihilators with the Brush Bandits to form Team Rage and Rage's early years from 1994-1996.